KitchenAid KHB100ER Hand Blender, Empire Red When I received the Kitchen Aid immersion blender several years ago, I'm sad to say it suffered the same fate (albeit temporary) as did the Cuisinart 34 years ago. It's so easy to take the lazy route and stick with the familiar rather than to learn new skills. So I hung it from the door where I'd be sure to see it and inevitably it became part of the scenery. I forgot about it for several years thinking if ever I wanted to purée soup in the pan I'd bring it forth. But this past week, when testing a one quarter recipe, and needing to whip just 1 egg white and 1/2 cup heavy cream I suddenly realized just how ideal the immersion blender would be for small quantities. I was so delighted to see that in addition to sharp little chopping blades, it came with two whisk attachments so I wouldn't have to worry about thoroughly washing the one used for the whipped cream before beating the egg whites. I also was so pleased at how easily these attachments fit into the silverware basket of my dishwasher. 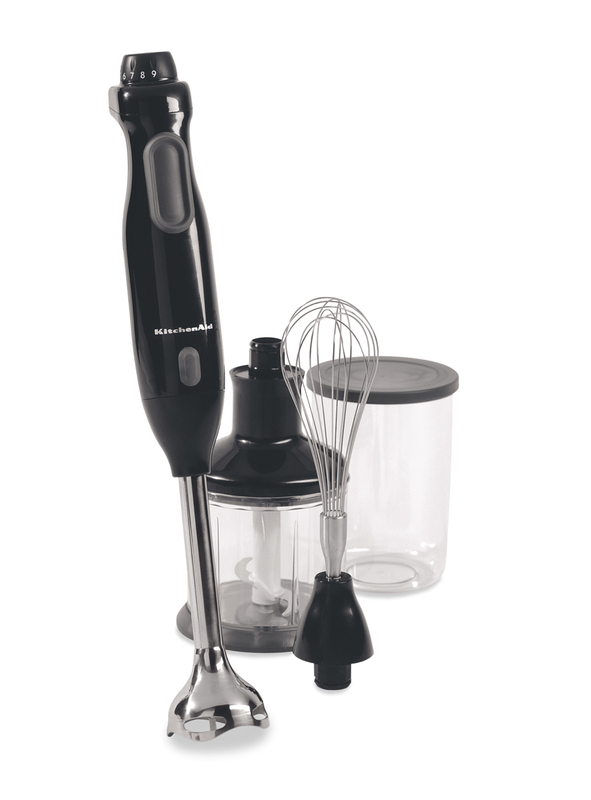 The immersion blender is now set in a place of honor reserved for indispensable kitchen tools. And I know what I'm going to reach for next time I have to chop fresh herbs. After something like the 10th test of a new recipe I decided to do a really minute amount requiring only 2 tablespoons of heavy cream. Light bulb moment: my favorite device for foaming milk for capuccino: the aerolatte! An added bonus here is that when the cream thickened perfectly the increased thickness caused the aerolatte to stop, ie no risk of over-whipping and turning the cream to butter! Aerolatte 1 Stainless-Steel Deluxe Edition Frother with Stand, Chrome This could start a new trend in looking at all my equipment with a "what else could it do?" mind set!